Plymouth Citybus have pulled off a real marketing coup on their latest promotion livery seen here on Dart 47. Promoting the new pensioner free travel bus pass with the slogan "One Goes - With ones new bus pass one can go anywhere one wants" this livery is sure to turn heads and create the 'buzz' that Citybus wants. 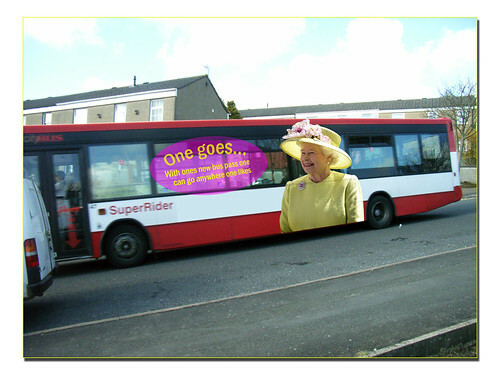 Featuring The Queen in this way in advertising is still seen as a bit risky but Citybus are sure she wont take offence. "Putting real life people on the side of our buses was all our own idea and when it comes to covering up the windows with contravision I think you will see that Citybus were there first too."